ANGLER Technologies, a globally renowned IT solutions provider has recently announced its participation in the 33rd edition of GITEX Technology Week 2013 scheduled to be held from 20th to 24th October at the Dubai International Convention and Exhibition Centre. ANGLER is a regular participant in GITEX trade show event and this year was no exception. In this year’s show, ANGLER has plans to exhibit its diversified e-business products with ground-breaking design, mobile and technology solution offerings to meet the changing market demands of the clients. Because of the overwhelming response from Middle Eastern audience, ANGLER is continually participating in this world’s biggest ICT event for the 8th consecutive year to unveil its latest solution offerings and to further extend and strengthen its position in the business industry worldwide. In this year GITEX Technology Week, at Sheikh Rashid Hall in Booth No: SR-104 A, we will have our higher management from both our Indian HO and Regional ME offices and stall representatives to interact with customers and address their queries by demonstrating our products and services. Our wide range of solution offerings include Mobile Applications Development, Content Management System (CMS), e-Commerce Solutions, Corporate Instant Messenger, Time & Attendance Software, E-Learning Solutions, CRM / SFA / Helpdesk Software, HR Solutions, Visitor Management Software, Survey Builder Tool, QR Code Generator and Web Based Event Management Software. Our end-to-end process knowledge and deep domain expertise has enabled us to deliver mission critical services in these verticals. ANGLER’s multitude of Technology Skill Sets include PHP / MySQL, CakePHP, Microsoft ASP.NET, Qt, Visual C++, Embedded C, Crystal Reports, Ruby on Rails (RoR), Filemaker, besides software development for Windows Phone, iPhone, iPad and Android Smartphone Applications and Open Source CMS including WordPress, Joomla, Drupal & DotNetNuke. Our Creative Design and Interactive Marketing Solutions include Responsive Web Design, UI Design, Multimedia HD Video Presentations, Product Demo & CBTs, Search Engine Optimization (SEO), Search Engine Marketing (SEM) and Social Media Marketing (SMM) services. We provide custom software services and always explore ways to keep pace with the latest technologies and strive to expand our range of products & services which can provide unmatched choice to our customers and add value to the organization. With our proven delivery mechanism and qualified talent we provide superior quality services with deadline discipline. We at ANGLER are ready to serve you with Outsourced Product Development (OPD) & Support, Software Testing Services, Offshore Staffing & Managed Services with a perfect blend of design and development solutions that assist you to drive your business forward. With subsidiary office in the region we have strengthened our reach to make a strong presence in the Middle East & GCC regions. We believe that GITEX trade show event is an amazing platform to facilitate joint ventures, strategic alliances and expand our customer base. Register with us Online & Get Free Tickets to meet us between 20th – 24th October, 2013 at GITEX Technology Week 2013 and see how ANGLER would add a lot of momentum to your business. This mega event will be a valuable opportunity for ANGLER to showcase to increase the visibility of the brands we carry, create awareness of the latest technologies in IT sector and help us reach out to a wider customer base. We hope to have a good participation of the potential business partners who can come and see what products and services, ANGLER has to offer. Visitors and participants may visit the ANGLER at Booth No: SR-104 A in Sheikh Rashid Hall. 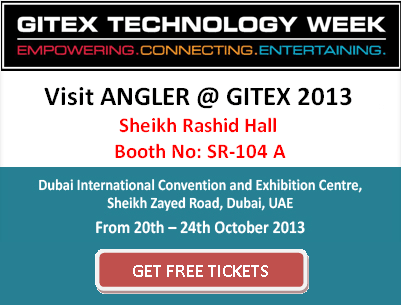 To schedule an appointment or a direct meeting with ANGLER Technologies at GITEX Technology Week 2013, please contact us here.